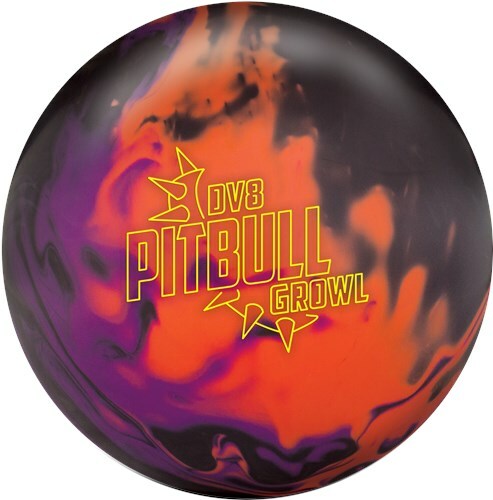 DV8 combines their Composite Claw Solid coverstock with lower RG and high differential asymmetric Pitbull core to produce the Pitbull Growl bowling ball. This ball offers max hook even when faced with the heaviest oil conditions. When you need an aggressive on the backend ball in the fight make sure you have a Pitbull Growl in your bag. The Pitbull Growl uses the Composite Claw Solid Coverstock and is a Low RG Asymmetric ball. The Pitbull Growl is a very strong ball best suited for med-heavily oiled lanes. I got the Growl to have a ball that would be a little longer than the original Pitbull but have as much hook and possibly be more angular. That is exactly what I got, the original Pitbull was the best heavy oil ball that I've had in years and the Pitbull Growl to me was even stronger. I used it for the first time on a Typical House Shot Pattern that had some carrydown from earlier in the day where they didn't strip the backends before our league. I used the Growl and it never stopped on the backend once it made its move, and the carry was great. I was able to stay with this ball all night and just kept moving left, the ball never stopped hooking. I had times in the past that I could only throw the Original for a few games and then it would start to lose some energy as I moved in, the Growl keeps getting stronger as I move in and continue to throw it right. Join Lane Side Reviews as they unleash a #GROWL for the ages as they take the new DV8 Bowling #PitbullGrowl to the lanes in this latest episode! This ball has some BITE to it! Drilled 4 1/2 inches off my axis point (pin just about under the ring finger), with a weight hole 1" short of the VAL. Tested on 38' house shot. Was able to play in the track area for just about a game before the Pitbull Growl started to rev up early, made a couple of adjustments and was able to stay in the pocket after moving right (I am left handed). As long as I was able to find some oil in the front part of the lane, this ball worked very well! If you are looking for a ball for heavy oil with some hitting power, here you go, the DV8 Pitbull Growl! This ball has a very smooth but yet strong roll throughout the lane and when the ball comes off the pattern it still has plenty of hitting power. Compared to the original Pitbull, the Growl has a stronger midlane roll and also has a better change of direction on the backends. Its the biggest and baddest heavy oil ball DV8 has made yet! Make no bones about it… the Pitbull Growl is meaner and hungrier than the original. The Pitbull Growl continues to impress me. It gives me a few feet of added length, compared to the original Pitbull, with a more pronounced hook down lane. My center hosted a Demo Day with the new releases and the Growl was one of the hottest balls. Its a big compliment to the Pitbull line. Even though the Growl boasts a Composite Claw Solid cover, the difference between the original and the Growl are easy to see. This ball is perfect when you’re looking for the added traction of a solid but more response down lane. For me, it allows me to open up the lane a little more, while not having to be weary of my speed. I’m never afraid of throwing this through the breakpoint. Here is the new ball in the Pitbull serie, the Pitbull Growl. This Pitbull uses the same core as the original Pitbull with a new coverstock offering more back end. I drilled it the same way I drilled my original Pitbull 60x4 3/4x40. I chose to go to a longer pin because we don’t bowl on really long patern really often. By drilling it this way, I can now use it on more typical house shots. On the lanes, this is my most aggressive ball. The Growl plays about in the same spot as the original. The difference is in the motion of the ball. The Growl is much cleaner in the front and goes about three feet longer than my original Pitbull before making a sharper turn to the pocket. Compared to my Magnitude 035 or the Blue Flame, I play the Growl about three boards left with my feet and 2 with my eyes. This ball can also be used on shorter patern or less oil volume patern by applying a polish on it. The ball with go longer and make a sharper turn. On the other hand, this ball is ideal for people with high speed. You can put a pad on it and still get a great reaction. To conclude, if you want to have an eye appealing and really strong ball, the Growl is your choice. Went 45x5x45 (pin over bridge) on my Growl with the intention of having a ball to use on fresh patterns at our local house which feels damn slick after replacing our aged Phoenix machine with a Flex. Our backends are still a bit tight and the original Pitbull (mine is pin down) just doesn't corner enough for me if I want to open up my angles at all. Out of the box I saw exactly what I wanted out of the Growl - strong traction with a moderate direction change down the lane. It makes a good enough turn down the lane to allow me to trick the ball to carry from inside, yet isn't so angular that playing further right remains a valid option for me as well. It has been my best look for games 1-2 on our house shot (44' Big Ben) but has also come into play in our challenge league on both 45' Route 66 and 40' Abbey Road. Compared to other balls in my bag, the Pitbull Growl aligns my feet 2/1 deeper than the Magnitude 055 by reading the midlane stronger, but with a comparable motion down the lane. The Kingpin aligns my feet another 3-4 boards further left than the Growl due to having a stronger motion on the latter half of the lane. I recommend the Pitbull Growl as an extremely versatile ball for medium-heavy oil. It is as strong of a ball as most will require for league and will traction enough to handle most tournament conditions. The Pitbull Growl is easily the strongest and earliest ball in my bag. I went with a 55 x 4 1/2" x 45 dual angle layout, which places the pin above my middle finger, and the mb beside my thumb. Oob this ball is insanely early and strong on my ths at my home center. After several surface changes I have settled on 500/3000 grit by hand. Keeping it here on ths provides me plenty of length with a strong, smooth but continous backend on fresh conditions. One of my likes about this ball is I dont see alot of burn with this ball even at lower grit levels, and it blends over/under very well. I got to use this ball several games this year at USBC Nationals in Syracuse. The strength of this ball came in handy on the Dbls/Singles event as well as first game of team. For my style, typically I dont get to use big asyms very much, but the ability to have some surface and still be fairly clean up front makes this ball hard for me to put down at times. The Growl will match up great for most every style, folks with higher tilt and lower rev rates will love the built in strength as the core revs up pretty fast. Tweeners will be able to get left fast with this ball, and chase the oil in as the shot breaks down. Crankers will love the continous shape on the back especially on fresh ths. Overall if you are looking for a ball thats strong but still is clean enough to turn the corner give the Pitbull Growl a look. Page created in 0.68 seconds with 23 queries.